The Jalview Desktop is an application you can launch from the web or install locally. It is designed for the kind of in-depth sequence analysis necessary when exploring new protein or RNA sequence families to understand how their sequence relates to structure and function. The Desktop can access sequence, alignment, 3D structure and annotation databases, and web services for multiple alignment, protein disorder and secondary structure prediction and functional analysis. Jalview desktop allows you to save all your work as a Jalview Project, and create multiple visualizations of the same alignment, making it easy to create figures describing your findings that can be exported as an image, an HTML document or an encapsulated Postscript file. Jalview is developed in Java, and the source has always been freely available. 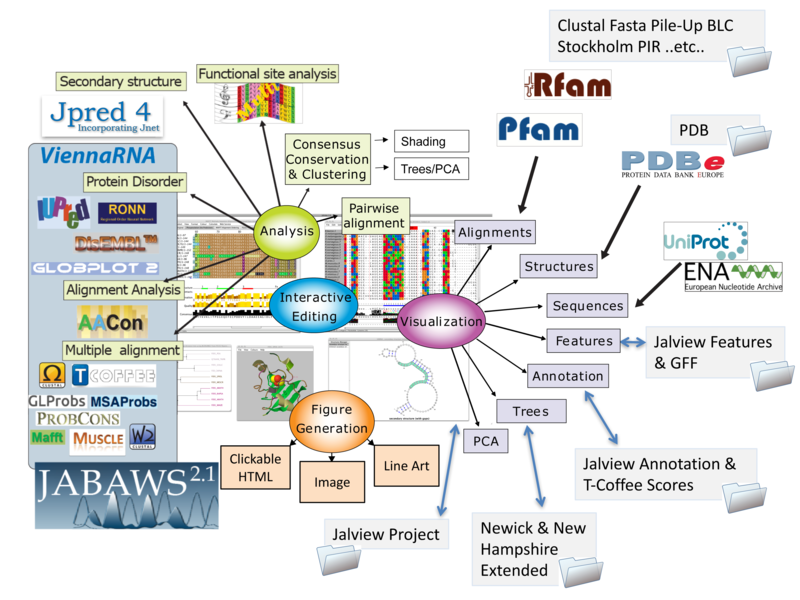 In 2010, we launched Jalview's own git repository, which lets bioinformatics developers from around the world contribute to Jalview. To find out more, head on over to Jalview Development.